The clematis is in full bloom. This will be her second summer and I'm hoping that she'll do better than last year. Although she grew quickly up the lattice last summer, she had very few blossoms. I chose a variety known to bloom from June through August so we'll just have to see how she does this year. The variety escapes me but I will make sure to add it to the post if I find the tag in my garden files! Just to show how big the blossoms can get, I've photographed one with my hand. As you can see, the blossoms are large. This photo from last summer shows the clematis growing strong but without blossoms. The limelight hydrangea (the white blossom hedge on the side of the building) did well last year and I'm looking forward to seeing how they do this year. As you can see from the first photo in this post (which I took this morning), the hydrangea bushes are bigger this year. I haven't pruned them at all so far because I want them to grow nice and big. I do remove the old blossoms in the fall however, as I don't want the winter snow to weigh them down and snap the branches. Note: I am slowly but surely adding some more before photos to some of my old posts. I was able to add some new photos to the The Exterior of the Old Sauna post here. Love the white clematis, very beautiful! 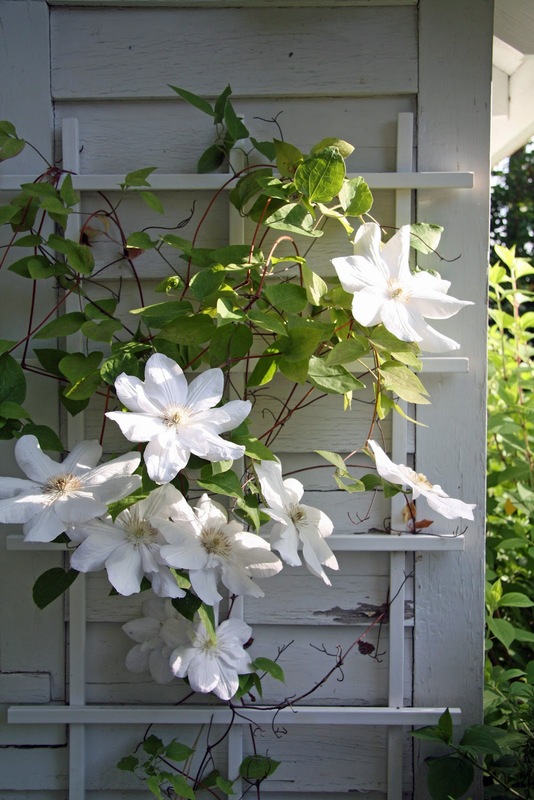 I have a white clematis too, it's called Alabaster, and it doesn't perform well at all. It didn't bloom last year and nothing this year either. I think I need to find a different place for it. The row of hydrangeas is perfect along the side of the building. I've always covered the stem part of my clematis' with another plant as I think the roots need to stay cooler, out of the sun. Yours is going to be gorgeous, that's a lovely bloom - so big too! Trina your yard is like a cover to a magazine! Can clematics take full heat or do they need shade. Hope you have a great tuesday! !!! What a vibrant clean color on that Clematis!Its so Beautiful and large! Its such a refreshing change as you always see the purple.Im so inLOVE with your Hydrangeas they are STUNNING! So lovely against the white shed. Your clematis is doing fine. In a couple of years, you'll look at it and think "how am I going to control this monster?". The blooms are gorgeous. Would love to know if you find the variety. Que flor linda aqui não tem esse tipo. Charming gardening house . . . do you use for guests or am I remembering a sauna . . . vague. The Clemantis is gorgeous . . . such a beautiful flower. I like your white on white . . . stunning. Trina...beautiful as always...What have you done with the Old Sauna? I must tell you that my heart gives a little leap when I see a received mail from "A Country Farmhouse." A midst all the spam I get, it's wonderful to read/view your beautiful postings. Thank you! I am swooning over both the white clematis (love) and the big, beautiful hydrangeas against your white siding. Two of my favourite things. Your home is just so lovely! I think the clematis you have might be the Henryi, which is a gorgeous whiite flower that blooms nearly all summer long. I had no idea they could be that large. such beautiful clematis; I've never had luck with clematis, it never seems to bloom? 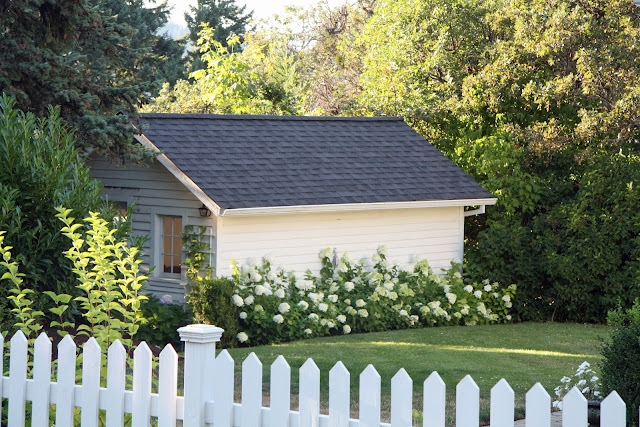 Your shed is so lovely; as well as all of your white hydrangea bushes; my favorite flower in the world! Beautiful blossoms! Love the Old Sauna! I love all the white the hydrangeas are my fav. Trina I have the same one and I just moved it. I cut it down and it's already growing again. They are resilient. I love them. Your yard looks lovely. Everything is so lovely that you blog about. Your life is lovely. Woah...i didnt know they will grow that big, thats pretty impressive! Amazing size! Always adore your yard....I'm wondering do you think that the clematis is getting enough sun? That could be one reason for fewer blooms or maybe because the blooms are the size of a watermelon, the plant doesn't produce as many :-)....fabulous! Amazing clematis, amazing garden...You must be so proud! Wow! Have never seen such a large clematis bloom! Beautiful. Beautiful! Love the green contrast on your building. Your clematis... gorgeous! your house & flowers/gardens are a dream! love it! Thanks for sharing the beauty. Just wanted to say what a beautiful and inspiring blog you have! I have gained so many helpful tips and ideas from your posts. We just purchased our first home and are having the hardwood floors refinished. I love the color of the stain you used on yours, not too dark or too light. Would you mind sharing with me the name of the stain you used? We actually matched the stain to the existing stain that was already here (in living room). Because of this, we didn't choose a color as the floor refinisher picked out the stain for us. You truly have a green thumb! Your garden is beautiful, and you get to enjoy such gorgeous flowers. Wish I had a little more patience for working outside. 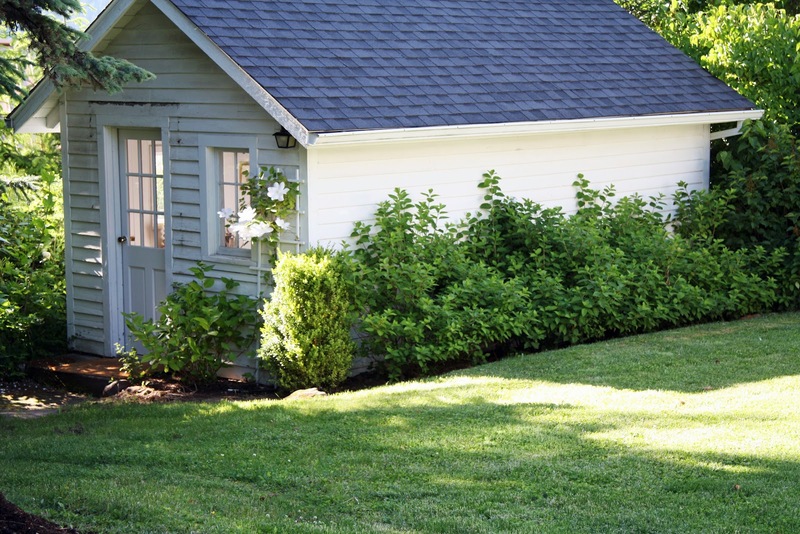 Your home and garden are beautiful! 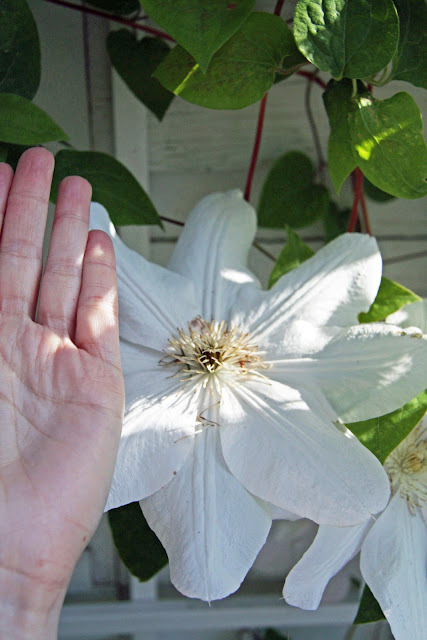 Wow the clematis blooms are huge & so pretty. I admire your lovely country life & your blog is inspiring. Thank you. Beautiful Trina! Hope you find the tag with the name!! We have some clematis on the front of the house, with no blooms. This post gives me hope that we will some day have blooms - they will have a nice softening effect on the architecture! In Japan, say the name of this flower is TESEN. Many are blooming in my garden. Season in Japan now is the rainy season. Are also a lot of hydrangea flowers. I love this so much, it´s gorgeous! Oh how i love the clematis.... I wonder if it will grow here in Victoria Australia - as well as it does in your garden.. Gorgeous... thanks for sharing..